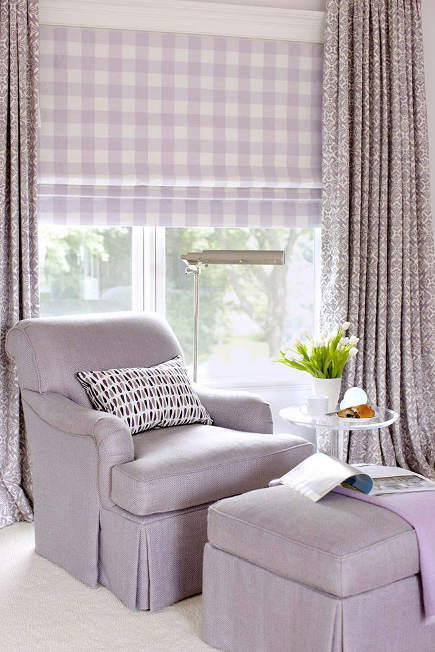 There’s an art to coordinating fabrics when it comes to window treatments and prints. That rises to the level of a fine art when window treatments are layered and two different fabric patterns are used on a single window. Many contemporary windows are not layered — only draperies, or perhaps a Roman shade, is used. In this ambitious and elegant example a fabric-covered Roman shade is installed beneath a pair of drapery panels. More commonly, bamboo or another natural material would be coupled with curtains. But the airy windowpane check (no pun intended) is a good choice if the shade needs to be totally light blocking — say for a bedroom. Plus, the check is a classic and well paired with the solid textile on the chair and ottoman. Why take the risk with a second pattern in the same scale and color family for the draperies? l expect it’s to do the unexpected — and there can be a sumptuous look with a window where fabrics are layered. Factor in a fourth fabric on the accent pillow and a fifth for the cashmere throw on the ottoman and the rule of using odd numbers is clear. But don’t snap your fingers. A less skilled or daring designer than New York’s Amanda Nisbet, who is known for her fabulous use of color, might not pull it off as beautifully. Every so often, a room contains an element that should be studied. I think this is one of them.